The first thing I want to point out, is that I am not a Beachbody Coach; I am not affiliated with the company in any way. I purchased Shakeology protein powder and the 3-Day Refresh kit myself. 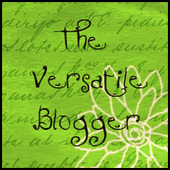 I am writing this review in order to share my experience for anyone who might want an unbiased opinion from someone who does not stand to profit in any way and has no vested interest in it. 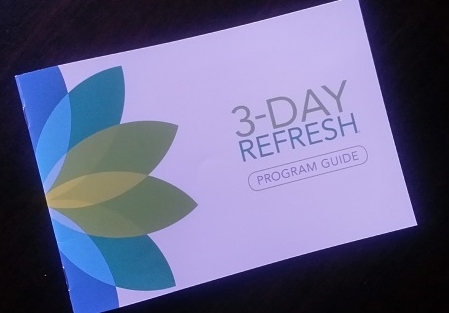 I have been curious about the 3-Day Refresh program since I first heard about it last Summer… but it only recently became available in Canada. It is not a fast, a juice cleanse, or a starvation diet. But let’s concentrate on what it actually is and my experience with it. 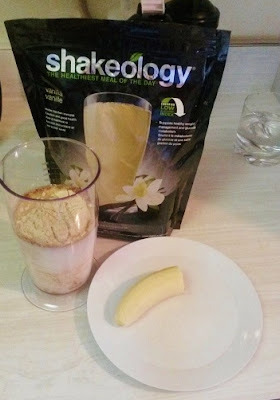 I had already purchased Shakeology protein powder so I chose a kit that did not come with more Shakeology. My kit had 3 days worth of high protein shake mixes called Vanilla Fresh, and high fibre drinks called Fiber Sweep, and a program guide book. The book has all the details you need to follow the program, laid out very simply. It also has information about the fruits, vegetables, fats, and juices you will eat in addition to the shakes, along with some recipes for your evening meal. The guide also has a lot of information and recommendations about how you might feel and what to expect during the 3 days. And it very clearly and specifically suggest undertaking only mild to moderate exercise during the 3-Day Refresh. And it also warns that you might experience bloating and gas from the Fiber Sweep drink. Throughout the day, as laid out in the guide, you will have 1 Shakeology shake, 1 Fiber Sweep drink and 2 Vanilla Fresh shakes. You will also have 2 pieces of fruit, fresh vegetables, 2 servings healthy oils or fats, green tea, lots and lots of water… and you may also have freshly made juice, veggie broth, and herbal tea if you want them. For those of you, like me, who refuse to give up your coffee… you may have it, but only black. I am going to detail what I did on each of the 3 days for you, and then I will tell you what I liked and didn’t like with my conclusions afterward. I normally drink lemon water mixed with fermented L-Glutamine when I get up in the morning. I also drink a magnesium citrate powder mixed with water before I go to bed at night. I didn’t see any reason not to have these things while on the 3-Day Refresh. I did not take any other vitamins or supplements though. The Shakeology protein powder and the Vanilla Fresh mixes are loaded with vitamins and minerals. I chose to do my 3-Day Refresh during a time when I had no pressing commitments on my calendar other than working from home on my computer during the first and third evenings. I did not have to dress up to go to work and I had no plans for entertaining or eating meals away from home. And the headache goes away! I have no experience with fibre mixes/drinks so I am showing pictures of what it looked like out of the package, and then mixed with water. It is not unpleasant; it has a citrusy taste and I just chugged it down. I did have to add a bit of water to the lumpy bits at the bottom to remix and finish it. Feeling kind of light headed and a just a wee bit gassy at this point but not bloated or uncomfortable. Ate dinner a bit earlier than normal because I had an online work session scheduled for 6 – 9 p.m. and I wanted to make sure I was finished with dinner and ready to work. The Vanilla Fresh is a bit watery and bland made with water but has a decent taste. The Lemony Green Beans were delicious. Feeling full enough but slightly ‘off’ head-wise. But within an hour of eating dinner I was feeling good again. I continued to drink water throughout the evening. Also had one more cup of black coffee about 9 p.m.
Slept very well. Woke up just before 7 a.m. feeling very good and not hungry. I decided to have a piece of fruit to eat along with my Vanilla Fresh shake, instead of having fruit blended into it. 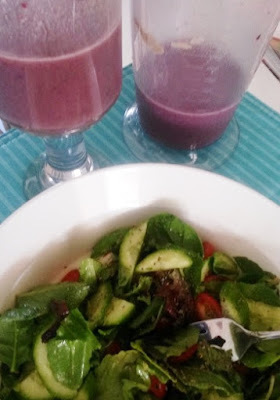 It seemed more like a normal lunch to me… salad, then my smoothie with the apple. I was very full after I was finished. The Vanilla Fresh seemed much thicker and way more satisfying made with the almond milk as opposed to having it made with water. Spent most of the afternoon on my feet working on a jigsaw puzzle. Drank a few more glasses of water and a cup of coffee. Experienced some tiredness in legs so decided to take a mag powder mid-day. It helped almost right away. A bit of gas as I drank my tea but no bloating whatsoever. I am wondering at this point when the Fiber Sweep is going to really kick in! I was not feeling all that hungry but did enjoy the taste of my dinner salad. And the Vanilla Fresh was better, too, with more cinnamon in it. Used about 3/4 tsp. Woke up about 6:40 a.m. feeling good and well-rested. Vanilla Shakeology mixed with 8 ounces Coconut Dream, 8 ounces cold water, cinnamon and 1/2 banana blended into it. Spent afternoon on my feet and drank 2 more glasses of water. 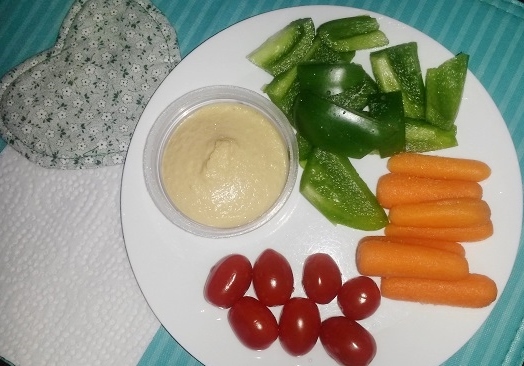 Green pepper, tomatoes, baby carrots with 3 Tbs hummus (again, a bit more than prescribed) sprinkled liberally with salt. I was scheduled to work online again from 6 – 9 p.m. so decided to space my dinner out in order to keep my brain fuelled to do my work. 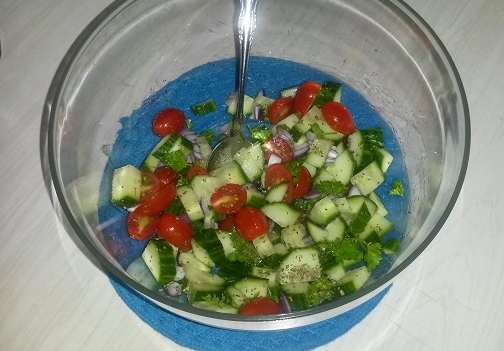 Cucumber and Tomato Salad (from progarm guide). Another very tasty salad! And I ate it very slowly… took about 1/2 hour to finish, it was so chewy and flavorful. Not hungry at all during the evening. Went to bed feeling good just after 11:00 p.m. The program is simple to follow, the guide book is well-laid out and easy/quick to read and the important parts easily referenced during the 3 days. The recipes provided for Dinners are really tasty and made from whole, fresh ingredients. 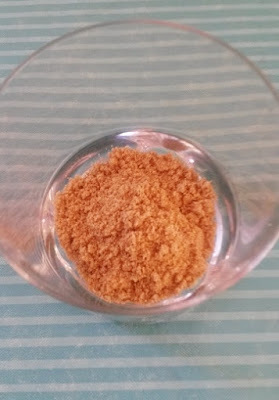 The Vanilla Fresh shake mixes were tasty and easy to drink and change up with fruit and spices. I did not experience much hunger at all. Actually, I was pleasantly surprised by this. I slept well and woke up feeling good. I was satisfied with the food I was eating and not obsessed with want to eat or snack or wondering when my next meal would be. I was allowed to have black coffee. I normally have my coffee black anway so this was no hardship for me. There is enough real food allowed to satisfy the need to chew. During the first day I felt a bit light headed and don’t think I was getting quite enough to eat. I was concerned about going to bed and feeling poorly during the night so I ate 1/2 banana before bedtime. I have just finished this 3-Day Refresh program. You might say that today is my Day 4... I have been up and away for 2 hours and, after my normal morning lemon water concoction, and 2 cups of black coffee, I am still not hungry. All in all this was a pretty easy program for me to follow for 3 days. I already normally eat whole real foods and use protein powders for smoothies and shakes so there was nothing really foreign or unusual for me here, other than the Fiber Sweep drink. I am not vegan, but the program can be, if you choose the vegan Shakeology option. I used the whey based powder. I mentioned the light-headednesson Day 1 to my Beachbody Coach, Danielle Prestejohn (who holds a Master’s degree in Nutrition and is a Certified Holistic Health Coach, and who has done at least two 3-Day Refreshes herself) and she suggested I might mix my morning Shakeology and my noon/dinner Vanilla Fresh powders with unsweetened almond milk. This added a few more calories and a bit more fat to my day. It not only made the shakes more palatable, it kept me fuelled better throughout the day. I never did experience any real effects from the Fiber Sweep. Danielle and I both think this may be because I already eat a diet full of fruit and veggies and high fibre carbs such as sweet potatoes and the occasional brown rice. The additional fibre was not a shock to my body as it might be for some people. 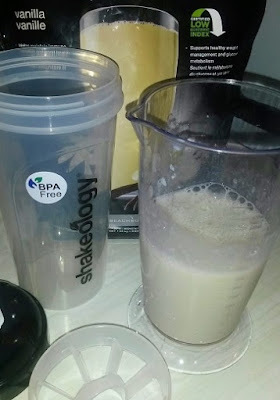 The Shakeology and Vanilla Fresh powders make very satisfying shakes. Normally, after eating a lunch of salad with lean protein and a serving of healthy oils I am wanting a snack a couple of hours later. 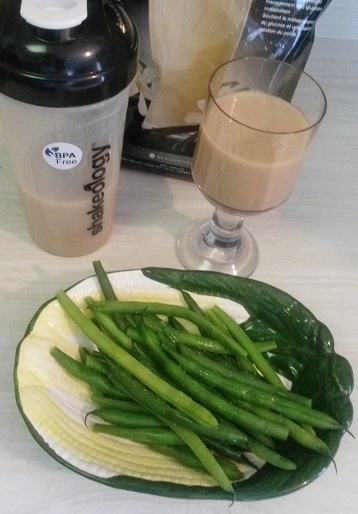 With the Vanilla Fresh shake for lunch, I was not needing a snack for 3 or 4 hours. They are so nutrient-dense that they sustained me longer. I am never going to do a program that insists I give up my coffee. You really have to limit your exercise/workouts. Although I did some yoga and did some walking, I would never have been able to go for a run or do any strength training. I did lose a few pounds... I know it's water weight... I didn't do this program to lose weight. I do have a flatter belly and am smaller around the midriff/waist. I should have taken before/after measurements but didn't. I am wearing my skinny jeans today! I think it is likely a very good program for someone who needs to put the brakes on eating too much processed food, or even a transition into eating more fruits and vegetables. And the Big Question? Would I Do it Again? YES. I am already planning a quarterly Refresh. I think it will be a good way for me to keep myself in check occasionally. So, have you ever done a program like this? In the first sentence you say you are no way affiliated with beachbody, but then at the bottom you say you spoke with your beachbody coach??? She meant that she wasn't a Coach. I agree...she said she was not affiliated at ALL! that means she just went on line like me and you and ordered not having any relationship or influence to the product at ALL! Having a beach body coach is an affiliation. Any person who purchases a Beachbody product is assigned a coach. Doesn't matter if you purchase through an infomercial, online, or directly through a friend. There is no option to withdrawal. Beachbody ALWAYS supplies you with a free coach. I ordered from amazon and you do not need a beachbody coach to do that. I wouldn't order a Beachbody product from any other source other than the actual website. If anything goes wrong with the product, shipping, you have questions about the actual product, Beachbody assigns you someone who can take care of all that for you. I think it would be a good jumpstart program or the occasional I hit a plateau and I need to shake things up program. What is the calorie count for this? I'm on day three of a juice cleanse and it's around 1200 calories so I've added in a Larabar each day and that's been working well for me! 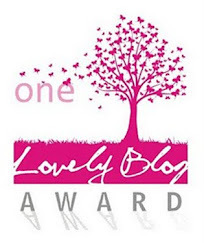 AS you know, I am not into this type of thing but I do get why others need a bit of a start. I just think they have to understand that if it is losing weight they want, you will gain back some after you go off the program & that eating healthy is something that is for life & a person has to find a way to do that long term to lose & keep it off. Looks very healthy, but I'm not a fan of the cleanse/detox. I try to eat healthy most of the time! Thanks for this review! I love reading an unbiased review! 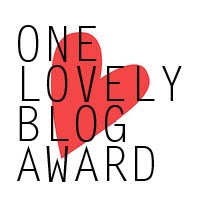 I don't know if I could do this, BUT if I were to do one, I think it would be THIS one! It is amazing how hard it is to give up caffeine when you are used to it. I've used Shakeology before, although not part of a refresh. Glad you feel it was worthwhile. I would have a hard time working this into my training schedule this time of year. Interesting. I've done a shakeology cleanse before, 3 days. I felt great on it, I'm sure this would be good as well. Interesting. I agree with you that it would be a good way for someone to "reset" and transition into new eating patterns. I did a 2-day "fast" a few years ago where I only drank their teas, soups, supplements and yes, there's no way I could've worked out. I'm not a big fan of cleanses/detoxes, but I'm glad you did an unbiased review on it! I think it'll be really helpful for people who are considering trying it out! I haven't tried any Shakeology products but this sounds like a good jump start program. I love the details you provided. Thanks for this review! Thanks for this review I've heard a lot about this and have been approached to try it several times. I think I'd still be hungry but it seems like it does what it claims to. i am normally not a fan of cleanses as I just get too darn hungry in no time, But I am glad it works for you! I'm a fan of reset type of things because it really works for me to nip bad eating habits that creep back in. This sounds interesting, thanks for sharing an unbiased review! Thanks for this review! I like that you didn't feel hungry. That's always my concern with these types of things, that I won't get enough to eat and want to gnaw my arm off and be miserable for days on end. I am in the middle of Day 1 of the 3 Day Refresh and full disclosure, I AM a Beach Body Coach and hope to be able to support and help others as I embark on this journey myself. 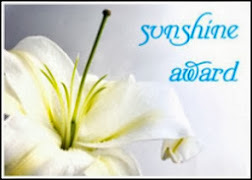 I appreciate your day by day plan. 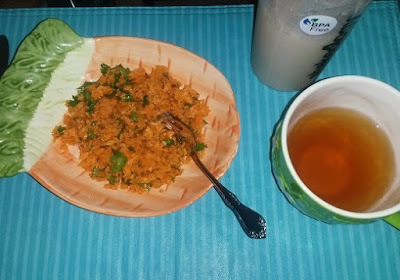 I am trying to prepare my body to start eating better as I have not been eating well at all this year due to a busy job. I think a 3 day program is just long enough to kick start better eating habits. 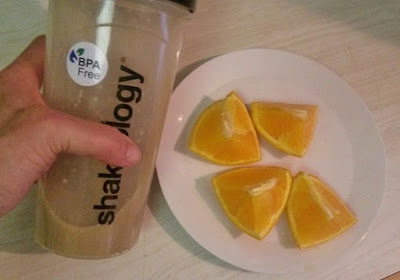 I am loving the Shakeology shakes - the Vanilla shake, not so much, and I am not thrilled about the Stevia, still reminds me of an artificial sweetener.....but I absolutely love the fruit and vegetable options, and the healthy fats cuz I love avocado and almond butter. I plan to work out in my home after this is done and have a complete transformation by summer of next year. I am on Day 1 of the 3 day refresh. I am not a Beachbody coach and I have tried Shakeology before and I was not a big fan of it. I got the Chocolate Vegan Shakeology, it was really dark in color. I added 2 drops of Young Living Orange essential oil to my breakfast shake and it tasted a lot better. The Fiber Sweep was better than I expected. It looked horrible but tasted fine. For dinner I made a mixed veggie stir fry with some broth and a lot of spices. It was pretty good, but I really am missing meat. As far as exercise, no weight training for these 3 days, just taking short walks. Hello Eat, Run, Sail, I just finished the 3DR, yesterday was my third day. I followed the program to a T, no coffee and my headache was HORRIBLE on day 2, but, chose caffeinated green tea and took acetaminophen which helped. I excised as normal at gym. I have quite a bit of muscle since I've been a dedicated gym rat for about 10 years now. I weighed 140 prior to 3DR....RESULTS: I weigh 135 this morning, lost 1 inch around waist and 1/4 inch on arms and 1/2 inch on hips. Perhaps, water weight, but, I drank lots of water throughout Refresh, so yet to be determined if the weight stays off. I did not like the vanilla fresh shakes, however, the addition of my 1 serving of fresh fruit blended in helped get the gritty liquid down. Fiber sweep was barely palatable and found it did nothing. I also felt less energized at the gym pushing myself hard as normal. I work out 5-6 days a week, interchanging between, cardio, kettle bells, resistance and high intensity training. My problem is I'm a foodie...steak, chicken, fish with insatiable flavors are right up my alley accompanied by a sweet tooth that lacks zero will power. It's difficult to eat clean when I enjoy cooking and going to the restaurant with the greatest buzz. However, the 3DR did change my perception of what I need and what I want. It's hard to admit to bad habits, mine is sugar and I already put in 1/2 the amount I normally would in my morning coffee and DIDN'T miss it and that over time will make a difference. So, yes, the 3DR was a challenge, I was hungry at times, the shakes were mediocre in flavor, my headaches were ACHING, but, I KNOW it's already changing my approach to food. I can still love it, but, maybe take those indulgences a bit less. Thanks for the post, and everyone else for the comments! I'm starting 3DR Monday and just wanted to know what to expect. Good to read what recipes you liked and I will pick up some almond milk too. 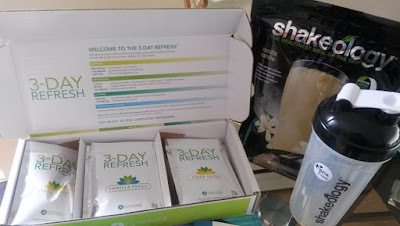 Hi, I wanted to share my review of the 3 day refresh as well. I'm not affiliated with Beach Boady. I have a friend who is a coach and told me about it, so I've been wanting to try it. I eat mostly good and I exercise 5-6 days a week. 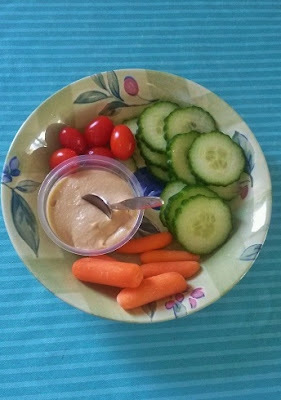 I did the 21 day fix extreme eating plan and loved it. It was not easy, but it was very doable and I got good results. I'm 35 years old, 5ft 4in, and have 4 kids. I started at 128.8lbs. I lost 6.6lbs and 6.5in in the 21 days. I was a little hungry, but I got use to it. I did cheat a little every once in a while. I used shakeology and I really liked it. I actually lost 4lbs in the first 3 days. I was amazed by this. I was going to the bathroom a lot and it was awesome to feel so regular. I've always had a problem with being regular in the #2 department. That 1st week I lost 4.2lbs, the second week I was bummed because I only lost 2oz (I was hoping I was gaining muscle from the workouts) the third week I lost another 2.2lbs. I got down to 122.2lbs which is good for me. I was able to keep most of the weight off until summer came and I went a little crazy with vacations and BBQs etc. I've been slowly gaining the weight back and I turned 35 in August. This year, I've really noticed my metabolism is slowing down :( After Halloween and hitting 132lbs on the scale I kind of freaked out. We are leaving on a cruise over Thanksgiving and I really want to feel better about myself in a swimsuit. 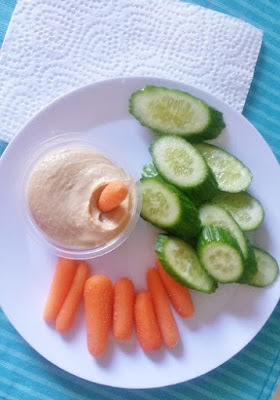 I started doing the 21day fix extreme eating plan again on Tuesday, but I only had 18 days to do it before we leave, so I decided to throw the 3 Day Refresh in to help speed up the results. I was already down 2 1/2lbs after 3 days on the 21day fix extreme plan. 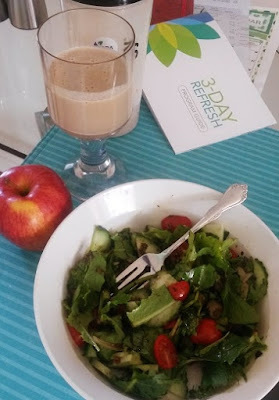 I was SO excited to start the 3 Day Refresh, I'd heard all the hype and the great results and my friend (who is a beach body coach) had just lost 8lbs in 3 days doing the 3DR (which I don't know how because she is already tiny and in great shape). My husband went out of town for the weekend, so I figured it was the perfect time to try it. I knew it would be hard and I'd be ornery, but I knew it would be worth it to lose (my goal was a minimum of 4lbs) in 3 days. The first day was super hard and I had a headache and zero energy and I was so hungry. 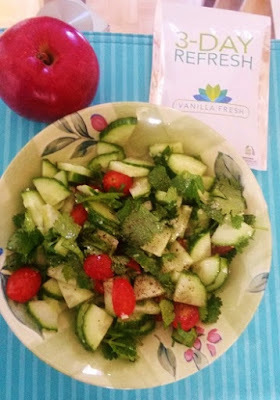 I didn't think the fiber sweep tasted too bad and I thought the vanilla shakes were pretty good (other than a little bit of a chalky taste) the cucumber, tomato salad recipe was delicious. I lost 2lbs after the first day and I was so excited and thought, "ok this is worth it" BUT………… Day 2 was just as bad. I felt super hungry and had no energy. I weighed myself the next morning and I had GAINED 1/2 lb. I wasn't too worried and figured I'd lose another couple lbs. by the next day. Day 3……..not getting any easier, so so hungry and so tired. I woke up this morning excited to be done and to see my results. (I also couldnt wait to eat some egg whites or something). Got on the scale first thing and I had GAINED another 1/2lb. So I basically went through 3 days of starving to lose 1 freaking lb. I totally could have done that on my own. I'm so disappointed. 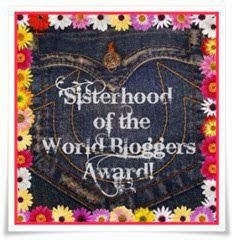 I never felt bloated or gassy, but I thought the fiber sweep would have me running to the bathroom. I only had like one bowel movement in the whole 3 days (probably because I was hardly eating anything). I thought it was supposed to clean me out, but I felt like it messed up my regularity. I called Beach Body this morning to get my money back. I have to pay to mail in the empty box and then they will refund me the cost of the 3DR minus the shipping I paid in the beginning. We will see if they really do. If I had lost 3 or more pounds, I wouldn't be sending it back and I would say it was worth it, but since I hardly lost any weight, IT WAS NOT WORTH IT for me. thanks for sharing! I'm starting today, right now & wondered about being able to use the almond milk, so very pleased to hear you used it with coach's approval. Tonight I am finishing my third day. I did not struggle with headaches or bloating, but I've been using Shakeology for about a month and eating a healthy diet so I don't think it was a shock to my system. I'm down two pounds (on top of 7 I'd lost right before the 3 day cleanse) so we'll see what I am at in the morning. My goal wasn't weight loss as much as just re-setting things (for lack of a better word) and getting rid of cravings. My favorite meal was the steamed veggies with coconut oil and I plan to make that for my family--they will love it. I am at after lunch on day two. I feel like death. I am foggy, have a headache, cannot think straight and starving! I feel like I committed and paid, so I need to finish, but this is miserable! Thanks for sharing your review! I am a new BB coach, though I don't coach. I only joined as a coach to get the discounts on programs and products. I have never done the 3DR and was very nervous about trying it. My doc demands that i stay on a high fiber diet, so I was worried this might not provide that. Thanks for sharing your experience. 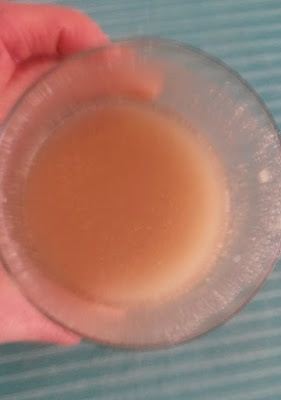 knowing that it's okay to mix in almond milk helps me a lot as I cannot stand Shakeology in water. 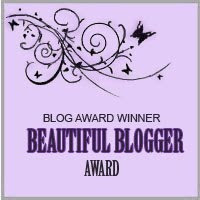 :) I appreciate your honest review! I've been looking for an unbiased review. I actually am a BB coach (discount coach - I only signed up so I don't have to pay full price). I've been nervous about trying this 3 day refresh out, but made the purchase yesterday so I'm looking forward to trying it out. It's just 3 days, right? Ha! Thanks for the review!! It's so hard to find them from someone who isn't a coach!